Commemorating the burning of LaGrange College-Military Academy during the Civil War in 1863. Last years Recall Lagrange Festival commemorated the 75th Anniversary of the Battle of Guadalcanal during World War II, with both Japanese and Americans re-enacting the campaign. It featured the only Marine re-enacting group in the USA, Company E. 282, 1st Sgt. George H Jones. The re-enactors also performed the Seven Years War, Revolutionary War, and Moderan War on Terror. 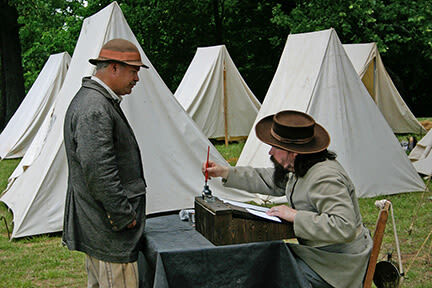 Other activities included the Cemetery Drama and the 1800's demonstrations. School Day is on Friday with Educational Activities for the kids. Main Event is on Saturday.